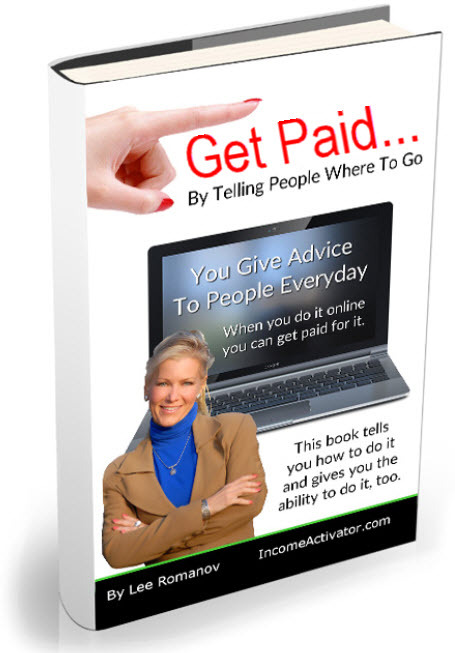 Lee Romanov is a motivational speaker, but more importantly she gives you an action plan that you can use immediately to start generating revenue online. Most websites are simply online brochures. 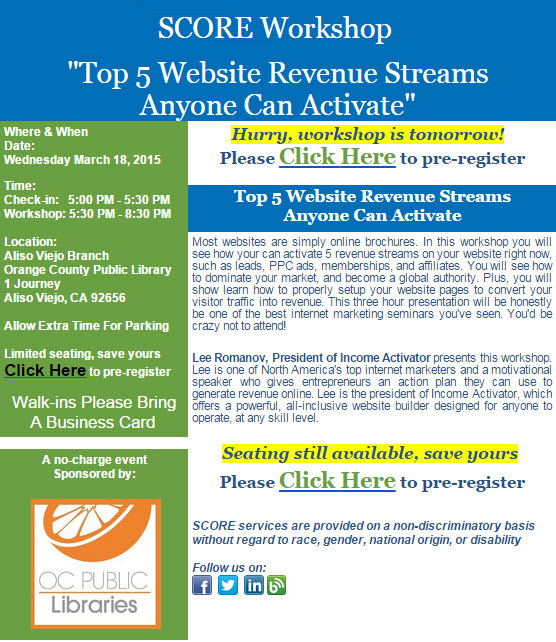 Lee shows how you can get a website you control and activate 10 Revenue Streams. pay you, and from your own personal recommendations. Lee provides information to people that they are not being told anywhere else. She is now speaking to SOLD OUT audiences that love her! Lee reports "Most people tell you how to get visitor traffic to your website, and how to make money online, BUT they've never really done it themselves. You need to listen the ones that have!" 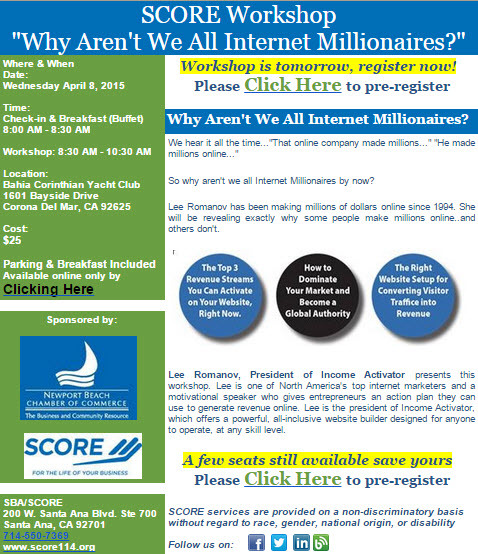 Lee Romanov, is self made, and has been making millions of dollars online since 1994. She knows what works, and what doesn't, and is telling all! Lee provides you with the knowledge of what to do, and gives you the ability to make it happen. Everyone in the world will soon have their own online business. Get ahead of the curve NOW. You need to hear what Lee has to say about independence! Book Lee Romanov to speak at your event by completing the form, or call 949-630-3346. 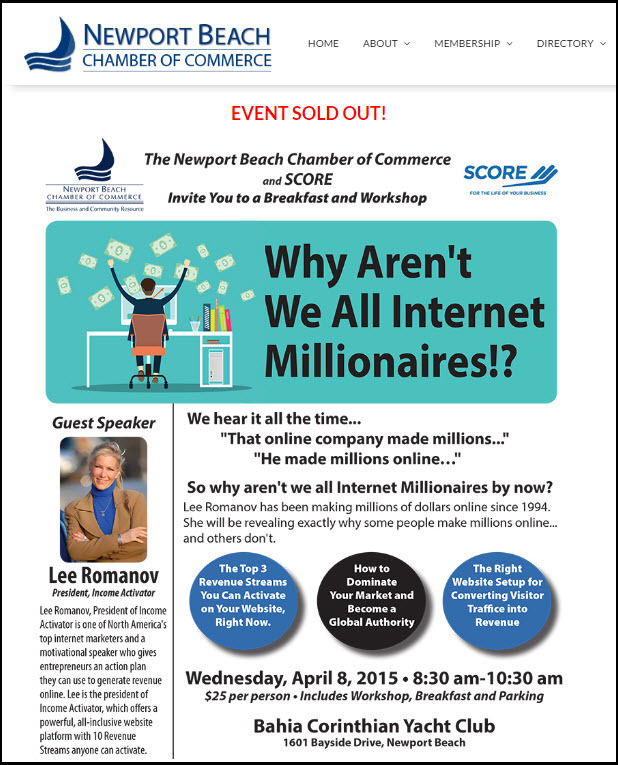 Lee Romanov speaks on all online or offline business topics, and marketing strategies. Here are some of her most popular ones. She can also customize any of these talks to suit your audience. 9. STOP Paying For A Website, Let Your Website Pay You! Lee Romanov is the president of Income Activator, a powerful all-inclusive website builder designed for anyone to operate, at any skill level. It focuses on revenue generation through several models such as leads, pay per click links, referral programs, memberships, white label products, online store, and affiliate partnerships. Lee Romanov has been making money online since 1994. She created one of the first profitable online corporations in North America that generated revenue through leads. Lee Romanov is one of North America's top Internet marketers, and is a Certified SEO Expert. Income Activator TV is a unique marketing platform designed to present business opportunities to entrepreneurs. Businesses featured include franchises, online business ventures, startups and work-from-home opportunities. The TV Show will launch in 2015 on Rogers Digital Cable TV, Channels 201 (SD) & 299 (HD) and will be viewed in 1.75 Million Rogers Cable Homes by 4.5 Million Consumers. Lee has hosted, and produced her own live to air Talk TV Show on CP24 in Toronto. It ran for 4 years in prime time, 6 pm and 9 pm. Lee Romanov is the founder of InsuranceHotline.com, the largest online quoting service for car insurance in Canada, also serving the United States, and the United Kingdom. In 2007 she sold her Internet business to Torstar, one of the largest media companies in Canada, owner of the Toronto Star newspaper, 106 Metroland community newspapers, Shop TV, and many other corporations. Lee wrote the Romanov Report, an e-newsletter, distributed to over 185,000 consumers, bi-weekly. Distribution would increase at a rate of 3,000 new subscribers per week. Romanov has appeared on numerous television and radio outlets, including CNN, FOX, CBC, Global TV, CTV, CFRB, BBC, CityTV, and several cable networks. She has been quoted in The Globe and Mail, Maclean's Magazine, the National Post, the Toronto Star the Toronto Sun, Newsday in New York City, The Ottawa Citizen, as well as many ethnic and community newspapers. Romanov has also received numerous awards from PR News Wire for her press releases being in the "Top Ten" highest read category. She was a columnist for the largest newspaper in Ontario, The Toronto Star, and for Canada's only national newspaper The Globe & Mail. Lee is the author of Car Carma, a satirical book comparing driver's tickets and accidents to their astrological sign. The book also provides good information about tickets, driving, insurance and the law. Car Carma has been featured by the media in Canada, USA, and internationally. It was also included in Reader's Digest's Special Edition of America's 100 Best. Lee also wrote TODAY'S Multi-Millionaires & Get Paid... By Telling People Where To Go. 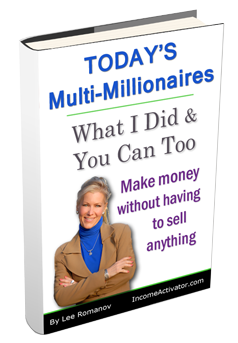 TODAY's Multi-Millionaires is a free eBook for all, and tells how you can be paid through the knowledge and experience you have right now. 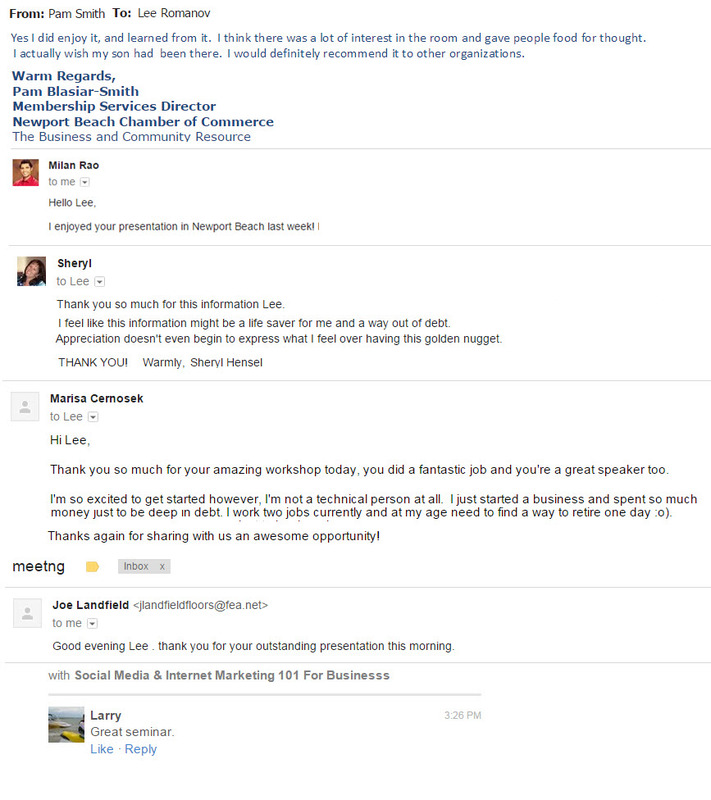 You can make money through your recommendations by sending people to companies that pay you. Even better, you don’t need to talk to anyone to begin earning money online. “I wrote this book after I built and sold InsuranceHotline.com to Torstar. All I was doing was recommending to people where to go, which generated millions of dollars in revenue. I discovered that up to 40% of people will follow your recommendations, which you can be paid for as leads. Whereas, only 1% might buy from you online" reports Romanov. Get Paid... By Telling People Where To Go is a dream come true for many of us. Through your own experience you can be paid for giving advice. You may even become an authority that people go to get the best information or advice. You can have people flocking to your website to see which companies offer the best services or who to buy from. You do it every day. It works like this. Imagine an accounting firm paid you $40 every time you recommended them. The Internet allows you to get paid just like that for your recommendations, Big Time! When you want to start creating an online income for yourself, I invite you to register for the Income Activator website platform with 10 Revenue Streams you can activate.